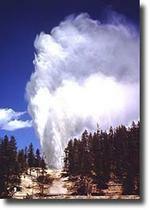 Integrating Research and Education > Yellowstone > Compelling Research Questions > Should geothermal energy be developed? Is the earth's heat under Yellowstone National Park an energy resource that is ripe for harvesting? Or is it best to leave that resource unused and protect the world's largest collection of geysers? This is a complex issue with geologic, environmental, political and economic factors that must be considered. Let's have a look at this issue with a guided tour through different sides of the story. This activity is designed with questions and web-based resources that can be used to answer the questions. At the end of the exercise, students are asked to formulate their opinion and to use the information they have gathered to strengthen their position. Of course, there is no "right" answer to this question, which is why this is a compelling topic for student discovery. Put simply, geothermal energy is using the internal heat of the earth to derive usable energy to create electricity, generate hot water or heat buildings. With an increasing public awareness about the US dependence on foreign oil, the potential of global warming caused by carbon dioxide emissions, and tightening environmental regulations, geothermal energy may have a prominent place in the energy future of this country. The production of geothermal energy emits much less carbon dioxide than burning fossil fuels, is generally considered a clean source of energy, and is plentiful in certain areas. For every source of energy there is a down side, and geothermal energy is no exception. In some areas, the flow of geysers and hot springs near geothermal power plants has declined or ceased. Mineral-rich discharge water has to be dealt with in a responsible manner. And many of our nation's geothermal resources are located in scenic, wild and protected places. Where in the US are geothermal resources located? Give a brief explanation for the distribution of geothermal resources in the US. That is, why is geothermal energy readily available in some places, yet not others? Geothermal energy is already being used in the Yellowstone region, as you can read about in Using Geothermal Energy in Montana. Give some examples of where and how geothermal energy is being used in Montana. 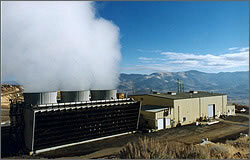 Geothermal Energy (more info) This site provides a nice background on geothermal energy, and gives specific examples of environmental impacts that need to be addressed. What are some environmental effects (both positive and negative) related to the use of geothermal energy? 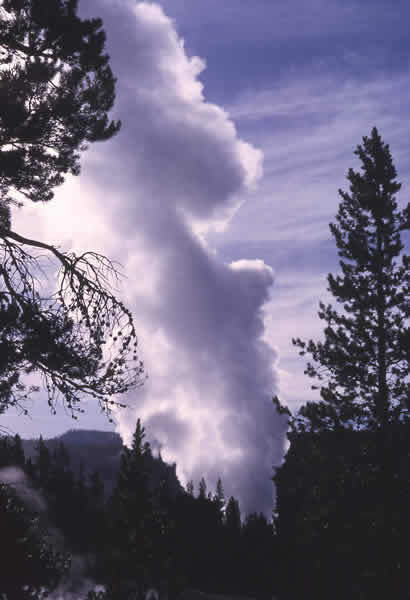 Here is information about Geothermal Energy and Geysers (more info) from the Energy Information Administration of the US Department of Energy. What creates the geothermal heat at Yellowstone? The following resources contain information about Yellowstone's geothermal features, and also provide a summary of some of the recent activity concerning geothermal development. 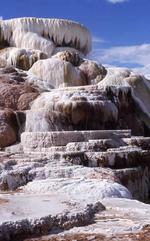 What types of geothermal features can be found at Yellowstone? What kinds of threats exist to Yellowstone's geothermal features? What has been done to regulate development and protect these features? The use of any resource is governed by federal and state laws, which can be complex. Below is a summary of some of the regulations that apply to the development of geothermal energy in and near Yellowstone. Geothermal Energy Development Regulatory Overview (more info) This site provides a summary of the laws pertaining to use of geothermal energy within national parks. Old Faithful Protection Act (more info) This bill was introduced into the US Congress to provide additional protection for Yellowstone National Park. The bill was passed in the House of Representatives but did not pass in the Senate. [link http://data.opi.mt.gov/bills/mca/85/20/85-20-401.htm 'U.S. 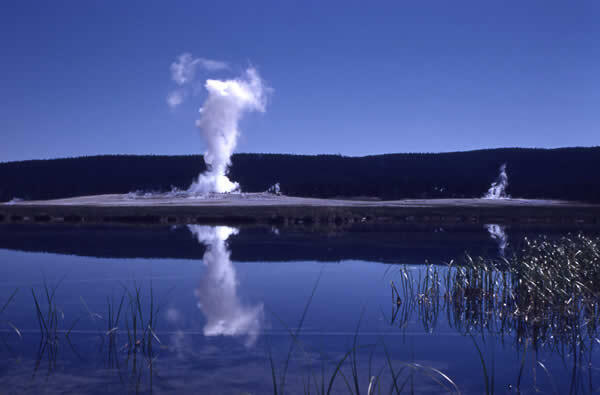 National Park Service-Montana Compact: Yellowstone Controlled Groundwater Area' After the Old Faithful Protection Act failed, the sate of Montana made an agreement with the National Park Service to closely regulate the use of geothermal waters near the park. Is it legal to develop geothermal energy inside Yellowstone Park? Is it legal to develop geothermal energy outside the park? What does research show about how the use of geothermal energy might impact the park? In 1986 a 140-meter deep well was drilled on private property owned by the Church Universal and Triumphant. This well is located 8 kilometers from the park boundary and 14 kilometers from Mammoth Hot Springs. The well produced hot water and when pumped the flow of nearby LaDuke hot spring was significantly reduced. Production from the well was ceased and an investigation was performed by the United States Geological Survey to determine if the use of geothermal water in this area might affect the flow of Mammoth Hot Springs. This report [Sorey et al., 1991] includes the results of this detailed research on the area's geology and hydrology. Is there a direct hydrologic connection between the area around Corwin Springs and Mammoth Hot Springs? What is the USGS recommendation about future use of the well and for similar wells in this area? What might be the hydrologic result if large-scale geothermal development were to occur? Before deciding on whether to pursue geothermal development near Yellowstone, let's have a look at similar projects elsewhere in the world. Give some examples of other places where geothermal energy is being used. What are some uses or applications of geothermal energy in these places? 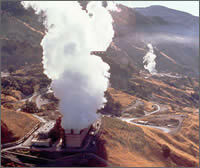 The Geysers power plant in California is the largest producer of geothermal energy in the United States. What is being done to mitigate these problems? What are some other examples of problems associated with geothermal energy development? How have these challenges been addressed? What are some political and economic reasons for and against development of geothermal energy near Yellowstone? Hydrogen Highway (more info) This opinion piece makes a case to go ahead with geothermal energy development within our National Parks. According to this author, what are some reasons to develop geothermal energy within the national parks? What are some of the recommendations for geothermal development that would protect Yellowstone's thermal features? What types of monitoring and further research are suggested? After exploring all of these various viewpoints and pieces of information, what do you think? 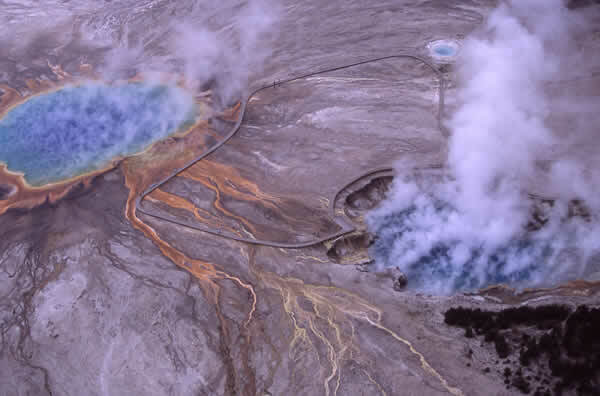 Should the development of geothermal energy be allowed in or around Yellowstone National Park? Do the benefits outweigh the potential negative effects? Why should geothermal energy development be prohibited from this region? Should geothermal development be allowed anywhere near the park? How far outside the park should developments be located? Make sure to use specific pieces of evidence, data and examples to make your case. What types of development would be allowed, and in what areas? What are your recommended guidelines for development? What types of monitoring should be required?